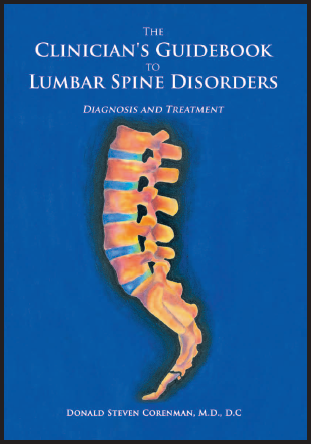 The Clinician’s Guidebook to Lumbar Spine Disorders: Diagnosis & Treatment was created to offer a comprehensive understanding of lumbar spine disorders. The concepts inside detail why back pain exists and offers explanations and treatment options to support each area of pain. Many original illustrations and images are included to visually reinforce the theories inside. The information provided in this book offers an organized layout starting with the anatomy and physiology of the lower spine and builds with pathology and genetics all in an understandable format. Discussed are the mechanics of lower back and leg pain and the separate genetic and inflammatory disorders that generate joint and neurological symptoms. Explanations are also provided regarding the techniques of taking a complete history and physical and then correlating these to specific spinal and non-spinal disorders. Imaging is used to explain and reinforce these findings. As both a spine surgeon and chiropractor, Dr Donald Corenman has developed a comprehensive understanding of lumbar disorders and conditions. His more than thirty years of practice on both sides of the fence have taught him that the treatment options expand when the disorder is well understood. This book covers the whys and wherefores of all lower back and leg pain management from chiropractic and physical therapy to surgery and is presented in a logical and easy to understand manner.